after the night's rain. They were everywhere, unusually so. 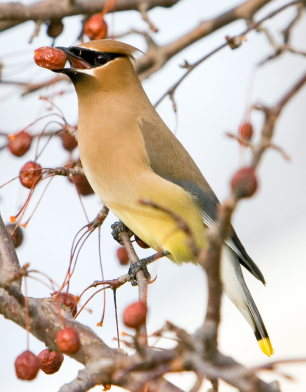 Suddenly it occurred to me that it was late March, and the cedar waxwings had never come. For years, on or about February 22, for two or three days great flocks of cedar waxwings descended into the area neighborhoods. They picked trees and bushes clean of berries, crowded together on every branch, swayed on topmost twiggy limbs. Then they promptly eliminated the berries. Once I even took an umbrella out into the yard as protection. Waxwings are sweet little birds. Over the years, the flocks have diminished, and become less predictable in their arrival. In the last few years, the waxwings traveled in the company of large robins. You have probably read about the dying bee colonies. Have you read this story about the dying bats? Which, btw, barely addresses the implications for the birds of prey who eat the dying bats... Did you know that bats have a major impact on crop yields? Around here, we think of them as mosquito hunters. So, are you noticing anything different about your songbirds? Where are my waxwings? Or my mom's hummingbirds, which used to visit her yard on their annual migrations? Are the routes changed, or are there much fewer birds or...? If you haven't seen the French documentary "Winged Migration", I highly recommend. It is a lyrical, poignant, beautiful film. Viewing it enlarged my understanding of the interconnectedness of birds, climate and humans. This morning was cool and sunny, full of birdsong mixed with a breeze lightly whooshing through fresh spring leaves. For cardinals, jays, finches and doves, there are plenty of berries. As I was savoring the morning, Max the feral cat dropped by. I feed him when he turns up, so he won't hunt the birds. It's a delicate balance. I wonder how we can do it globally? Carol~ I love the Cedar Waxwings! The ones I have seen in the past have red "wax" tips, not yellow, so this was an interesting picture. We used to see them when we lived in Austin, but now I'm in Georgetown and I have not noticed them in the past or this year. I'll be on the lookout for you! Thank you for your kind post about my blog. Yes, I am the Suzi of journey. That was my first blog and I need to pay more attention to it. I tend to only write on it when the mood strikes me. :) Your blog is looking great! Keep it up!